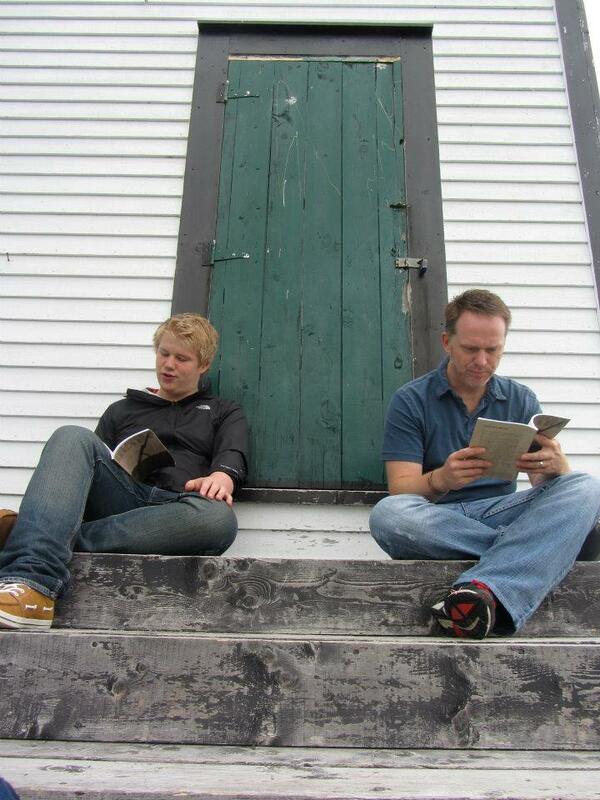 First read-through of Soldier's Heart, Jacob and Jason Paquette on the steps of the train station in Bay Roberts, Newfoundland, where the play is set. See Writing Home at the Tarragon This Week! 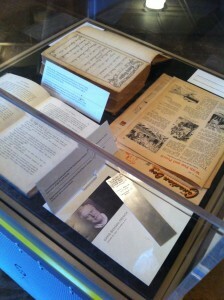 The Tarragon, where most of David's plays were originally produced, is hosting the marvellous National Arts Centre/Theatre Museum Canada display about his career, Writing Home. The exhibit will be open to the public for free from today until September 30, on each day that the Tarragon has a show. Check the Tarragon website for details about dates and times: http://www.tarragontheatre.com/ If you're in the Toronto area, please go see the exhibit. It's a great tribute to David and his work. 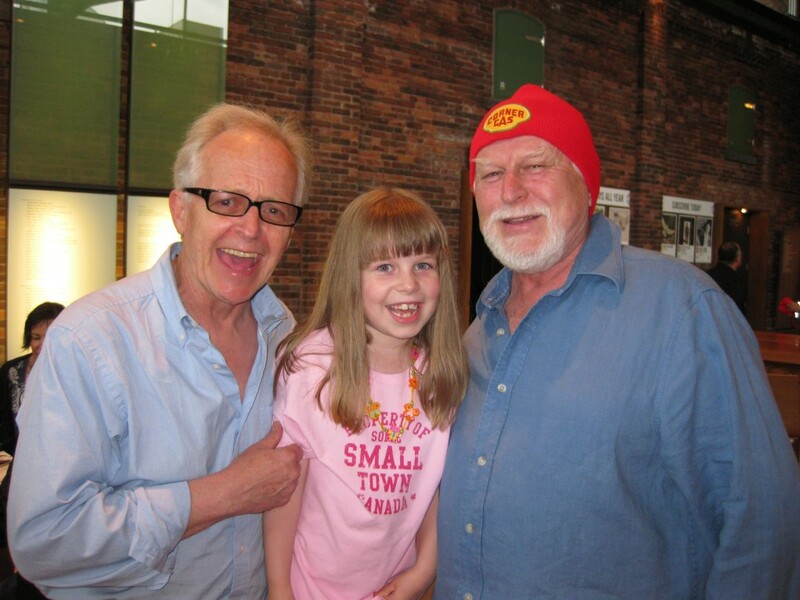 Congratulations to actor Eric Peterson, who was recently appointed a Member of the Order of Canada. Eric was in two of David's shows: The Seagull at the Tarragon in 1977, and Of The Fields, Lately at Soulpepper Theatre in 2009. I had the privilege of seeing the latter, and Eric's portrayal of "Uncle Wiff" was heart-breaking -- a masterful, brilliant performance. Of course, Eric is renowned for the marvelous musical Billy Bishop Goes To War, and as Oscar Leroy in "Corner Gas," among his many other accomplishments. Congratulations to Eric and his family! A well-deserved honour for one of our country's finest actors. 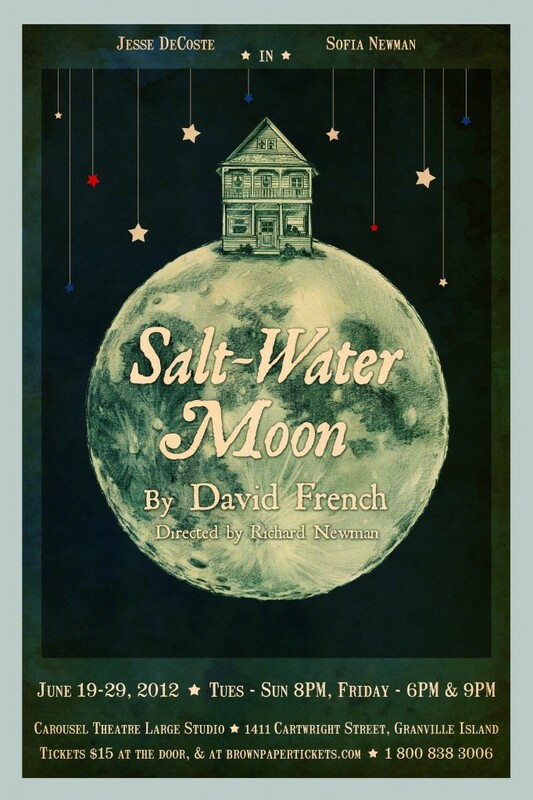 A production of Salt-Water Moon on Granville Island next month stars two amazing young actors: 18-year old Jesse DeCoste, and 16-year old Sofia Newman. The two got to know one another during a high school production of Grease. Sofia and Jesse are both serious about pursuing careers in the theatre, and Jesse is off to LAMDA in London in the fall. The fact that the actors are so close to the ages of the characters in the play will add an authenticity to the show...and both have proven that they have the acting chops! Sofia has a family connection to David's work -- her mother, Lisa Bunting, played April in Bill Glassco's wonderful production of 1949 at CentreStage (now Canadian Stage.) Sofia's father, Richard Newman, directs the show. He once played Jacob in Of The Fields, Lately -- and he saw several premiere productions of David's plays while in Toronto. Designers for the show include Amy McDougall (costumes) and Sean Malmas (set and lighting), both of whom have worked with the Bard on the Beach Shakespeare Festival. Further information about the show can be found here: http://www.brownpapertickets.com/event/241512 Break legs to all involved! If you're in the area, be sure to pick up tickets. The show runs from June 19 through 29th at the Carousel Studio Theatre. I'm happy to report that Theatre Northwest in Prince George, B.C. will be producing That Summer in September and October. Theatre Northwest is one of Canada’s smaller regional theatres, but the organization has gained a reputation for its exceptional production values, its penchant for casting from across the country, and the local enthusiasm for Canadian work. 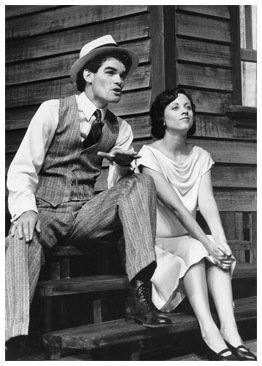 Some of the theatre's most popular productions include Corker by Wendy Lill, A Guide to Mourning by Eugene Stickland, Amigo’s Blue Guitar by Joan MacLeod, The Invisibility of Eileen by Kit Brennan, Thy Neighbour’s Wife by Tara Beagan and the works of Norm Foster, Guy Vanderhaeghe and Lance Woolaver. And 1949! Here's a link to the Theatre Northwest website: http://theatrenorthwest.com/current-plays/ I'll keep you posted as I find out more details. Leaving Home at Cawthra S.S.
About a week ago I received a notice from David's agent Charlie Northcote that Cawthra Park Secondary School in Mississauga will be performing Leaving Home during the last week in April. I wrote to teacher Stacey Tiller to ask if she'd mind sharing a few details with me to post here as the show progresses. She wrote me a beautiful email about what David's work -- and his personal interest -- has meant to their school. I will quote some of it here: "I was delighted to hear from you as your late husband's work has played an important part of our theatre education here at Cawthra for many, many years. In fact, two years ago, David came in to our school to talk to our Grade 12 students about playwriting. They were amazed and inspired. In our grade 10 year we study all of the Mercer plays for our Canadian Theatre unit. That collection of plays are my all time favourite plays and am thrilled to be able to direct Leaving Home. Writing on the blog would be just fine! And as soon as we get some production photos, I'll send them on to you along with our poster. If you need further information, please let me know. I'd be more than happy to oblige. Thanks so much for your interest. My condolences on David's passing. While I didn't know him personally, his work will always have a place in my heart and at our school." Thanks, Stacey. David was often asked to do school visits, and sometimes it took up a whole day, as he always used public transportation. He usually came home energized and inspired by the students and their interest in his work. It's great to know that students appreciated his making the effort to talk to them. 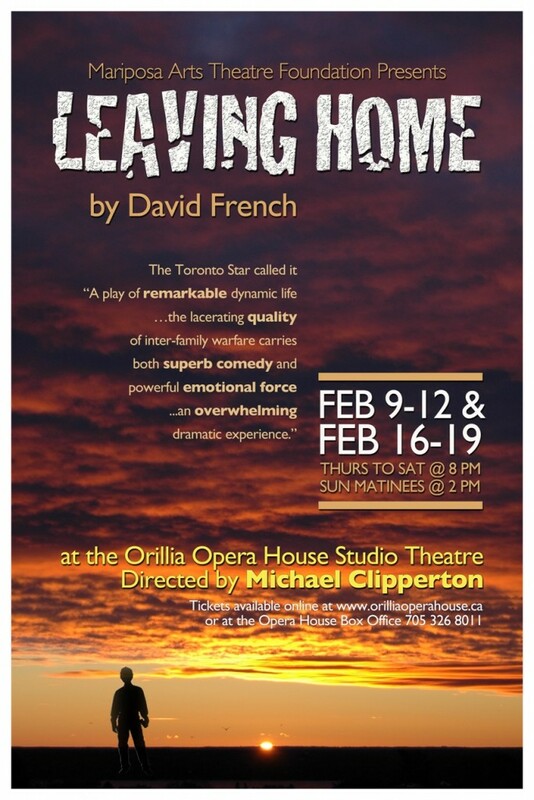 Break a leg to the cast and crew of Mariposa Arts Theatre's Leaving Home, which opens tonight at the Orillia Opera House. Paul Blanche, who plays Harold in the show, sent me a copy of the beautiful poster he designed for the production: ﻿﻿ Michael Clipperton, the director, wrote an article for the February 2012 issue of The Green Room that gives some insight into the cast's rehearsal process. He's kindly given me permission to quote from the piece here: “In his first play, Leaving Home, which is based in part on his relationship with his father, the late playwright David French presents a story of troubled relationships, unspoken desires, and consequences of epic proportions. 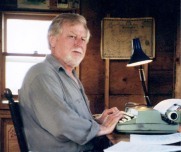 He also gives us some earthy bawdiness, some classic Newfoundland humour, and an unbridled joie de vivre. Among the questions that he asks are: What is a family? What does it mean to be a father? A mother? A son? A daughter? A husband? A wife? What does it mean to work all your life to support your family, and suddenly see that family break apart? What does it mean to be so angry that you strike the person you love most? What does it mean to feel trapped in a situation that is beyond your control? Delving into the world of the Mercer family has revealed many things to me and to the cast and crew. It has been a thought-provoking, laughter-filled journey…” The show has eight performances, Feb. 9 to 12 and Feb. 16 to 19. Tickets are available from the Orillia Opera House box office, 705-326-8011 and online at www.orilliaoperahose.ca.